I do believe there is something inside me which is bigger than any obstacle. This will be my mantra for the next while. I shall view it every day and meditate upon its' meaning. It is true. I am there. 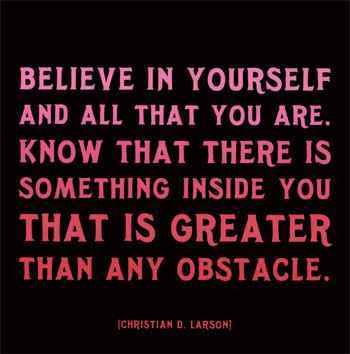 I believe in myself. This exercise is practice for me. I accept that with grace. No new news. I will be present at a meeting tomorrow between the seller (who I purchased the property from) and the real estate agent. I am wondering if indeed there will be a meeting. In any case, I will show up. I am present at the office every day and will continue to make my presence known until this is settled. I have lost my trust. I have been betrayed. It is difficult to trust even what I am told about a scheduled meeting. Time will tell. Dialogue has begun. It will take time. I am practicing patience. A good lesson for me. Don't want to be too patient though -- my house needs me. The workers need to be back to work so they can support their families. We will see what tomorrow brings.